DURHAM, N.C. – Duke freshman Ross Martin has been named one of 20 semifinalists for the 2012 Lou Groza Collegiate Place-Kicker Award presented by the Orange Bowl Committee, announced on Monday by the Palm Beach County Sports Commission. A native of Solon, Ohio, Martin has totaled 83 points through 10 games this season, making 16-of-18 field goal attempts and all 35 of his PATs. In the ACC, he ranks seventh overall in scoring (8.3 points per game), third in field goals per game (1.60) and second in field goal percentage (.889). Martin leads all freshman kickers nationally in total points with 83, marking the fifth-highest single-season total in school history. He has already set Duke freshman records for points in a game (15 vs. North Carolina), field goals in a game (4 vs. North Carolina), field goals in a season (16) and points in a season (83). Martin is joined on the semifinalist list by Brett Baer (Louisiana), Casey Barth (North Carolina), Chris Boswell (Rice), Jeff Budzien (Northwestern), Anthony Cantele (Kansas State), Chandler Catanzaro (Clemson), Brian Davis (Arkansas State), Trey Farquhar (Idaho), Brendan Gibbons (Michigan), Dustin Hopkins (Florida State), Michael Hunnicutt (Oklahoma), Austin Lopez (San Jose State), Mike Meyer (Iowa), Jaden Oberkrom (TCU), Cairo Santos (Tulane), Steven Schott (Ball State), Quinn Sharp (Oklahoma State), Jeremy Shelley (Alabama) and Caleb Sturgis (Florida). Semifinalists will be voted on by FBS head coaches and SIDs, along with national and regional football writers, and past Groza winners to select the three finalists. These finalists will be announced on November 19th and honored at the 21st annual Lou Groza Collegiate Place-Kicker Awards Banquet on December 4 in West Palm Beach, Fla. The winner will be announced live on the Home Depot ESPN College Football Awards Show on Thursday, December 6. The award is named in honor of one of the all-time great kickers in football history, Lou Groza. Groza played 21 seasons for the Cleveland Browns setting numerous franchise records, including most games played, most points scored, and an amazing 107 consecutive games in which he scored a point. Groza was inducted into the Pro Football Hall of Fame in 1974. Past Groza finalists include current NFL kickers Sebastian Janikowski, Nate Kaeding, Mike Nugent, Mason Crosby, Garrett Hartley, Kai Forbath, Blair Walsh, Dan Bailey and Randy Bullock. Four Duke players were named to preseason Award Watch Lists this week, while a few others may have been overlooked. 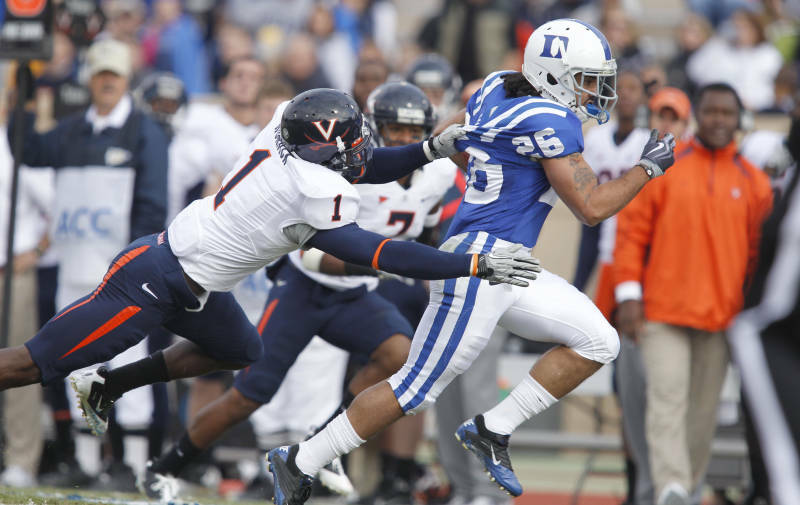 Coming off a three win season, it’s only natural that Duke might have a few players fly under the radar on the national level, but that should all change this fall, as the Blue Devils pursue bowl eligibility. In any case, it’s a nice honor for the Duke players who were recognized this week, and we congratulate them, but look forward to an even better 2011. 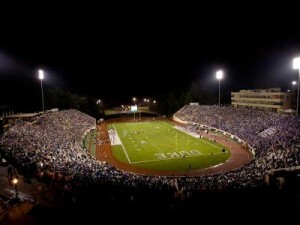 Part of our job here at BDN is to help give fans an inside look at the Duke players and coaches. Sometimes, however, the players and coaches do the job for us. This week, Duke’s star senior WR Donovan Varner created the first entry in his self-produced video blog, The Dondo Files. Varner is poised for a big senior year, and we hope his video blog will be a good inside look into his season, and the Blue Devils’ first bowl game in over a decade. Another interesting venture by two Blue Devils is Middle Child, a clothing line created by Johnny Williams and marketed by Matt Daniels. For those who missed Johnny’s cartoon series for GoDuke last year, take a look at his clothing designs, which show off the Duke cornerback’s impressive artistic ability. 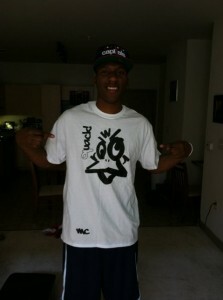 And if ndotsmitty is wearing it, you know it’s hot! While we’re applauding the Blue Devils’ off the field efforts, it’s important to point out that last year’s team had a cumulative GPA of 3.1, which included 13 ACC All-Academic selections, more than twice any other school. As we’ve said before, it’s great to see that as Duke builds the program on the field, they continue to uphold the university’s strong academic reputation. The Duke players are setting themselves up for a great future and truly embody the concept of the student-athlete. Kickoff on September 3 is just 57 days away, with training camp opening in just a few short weeks, so be sure to get your season tickets now. With spring practice having wrapped up in March, it’s been a long time since we’ve seen the Blue Devils on the field in Wallace Wade Stadium. 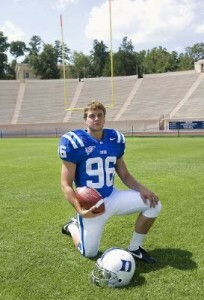 For the Duke Football faithful, we share your pain, and hope that these last few weeks fly by. We’ve kicked off our opponent preview series this week to help speed things up for you. Be sure to check out the Richmond preview, and check back on Sunday for our Stanford preview. In the meantime, if anyone happens to see me camped outside of Wallace Wade like Eric Cartman waiting for the Nintendo Wii, can you bring me a sandwich? A couple notes on this group: Todd Gurley has been in France, running track for Team USA, which has led him to miss “The Opening” in Oregon this week. Korren Kirven is the only member of this group that is in Oregon, and while Duke has made a good impression, the reality is that he may be a long-shot for the Blue Devils. Woody Baron, as we reported awhile ago, appears to be down to Virginia Tech and Vanderbilt, but if Duke could get a visit, you never know. Do you like surprises? Well, I actually am not a big fan, so I’ll just give you the update. Once the dust settles on the LBJ and Adidas coverage, we’ll have new interviews with Marcus Allen, Keilin Rayner, Anthony Nash, and David Reader. We’ll be getting in touch with the other remaining targets, too, but we have to pace ourselves! Thanks for being a member and a loyal Football Friday patron. We hope you enjoy our coverage and always would love to hear more from you on the message boards.